I have recently become addicted to My Country on the Android platform. Judging by the fact it is currently number one in the Top Grossing Apps chart at the Android Market I’m not the only one. The thing is – is it really a game at all? If you’re not familiar with My Country the basic idea is to build a flourishing city. It is like a mini version of Sim City scaled down for smartphones. The game is free, but you can buy Country Bucks that allow you to speed things up and some content can only be bought using Country Bucks. There are also Game Dollars which you accumulate over time and they can be used to buy the majority of buildings on offer, but not all of them. Many of your businesses, industries, houses and other structures require specific professionals and in order to hire them you have to collect the right items. Some of these items are awarded as bonuses when you build certain structures or when you collect income from them, but you can also buy them with Country Bucks if you splash out some real cash. I’ve been playing the game for a few weeks now and if you are patient you can build a bustling metropolis without splashing out any real cash. 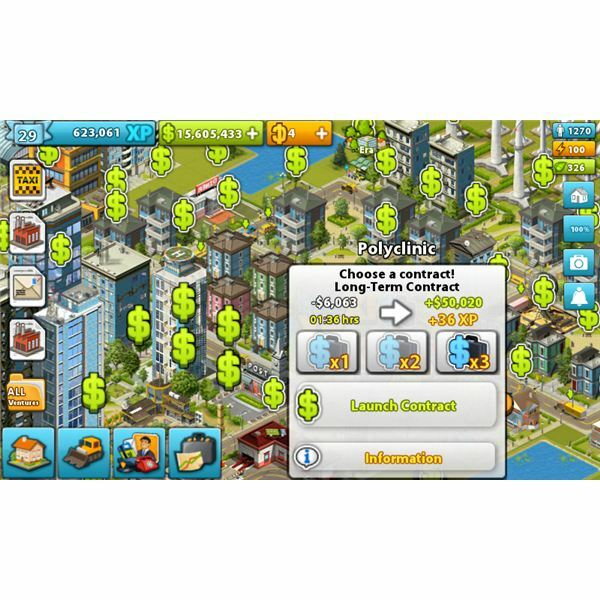 This means dipping into the game a few times a day to collect your earnings and start construction of new buildings. It’s not something you can sit and play for hours straight, but this kind of dip in and out gameplay is well suited to smartphones. The thing is you will inevitably reach a point where you can’t complete your city without spending some real cash to get those Country Bucks. This model reminds me of the classic drug dealing tactic of giving you a free sample to get you hooked and then jacking the price up. I remember when Sim City first came out and there was some talk about whether it was really a game at all. It is completely open-ended, there is no victory condition and the addictive hook is all about accumulation. You want to see every building possible, unlock every bit of content and then, when you do, the game is instantly boring. I think that’s why Sim City included the option to destroy your city with natural disasters or Godzilla attacks. The difference is that Sim City is a genuine simulator of sorts. The transport system, the pollution levels, the number of houses, everything was linked and you had to balance carefully to keep your city running. My Country has extracted that addictive hook, but it has none of the simulator side. There is a nod to ecology but all you have to do is build parks or trees to keep your rating up, it doesn’t have a visible effect on the city. You can build services for your population and transport links but they have no real impact on how your city functions. Building and upgrades are all a means to make more money and build more. There’s no real tactical depth and no learning curve. For developers, this style of free to play with in-game purchases looks to be a winner. Not only is My Country the top grossing app, their previous release Paradise Island is number three in the same chart. The reviews of both games are overwhelmingly positive, although you’ll see the odd complaint about how difficult it is to progress without buying some Country Bucks. There’s no doubt this is a frustration and the slow pace of the game and difficulty in getting certain professionals without spending on Country Bucks is clearly deliberate. I have experimented with building structures that potentially produce certain items for professionals over and over to try and get the one doormat or digital watch or helicopter keys that I want and it seems likely that the game deliberately doesn’t give you what you are looking for (at least not without tedious persistence). You can’t blame the developer for wanting to make some cash though, and they seem to have found a clever way to do it. They’ve also included small ventures in the game that give it some focus, such as building a specific structure for a reward. The fact that one of the early ones is an in-game reward for writing a review of the game on Android Market is a really clever idea for promoting it. They’ve also integrated Facebook so you can upload photos from the game (not something I’d ever do, but it’s also a good promotional idea). Since many developers are struggling to see a good return, especially in the Android Market, we can expect this model to be adopted more often in the future. As clever as their profit tactics are they’re also intrusive and annoying. I have always disliked the buy your way to victory option because games should be about achieving something. There’s absolutely no skill involved in My Country and while that makes it accessible and addictive in the short term it becomes irritating over time. The other problem is that once you have unlocked every bit of content the game becomes pointless. There’s no real management of your city to get immersed in, it is all slanted towards accumulation. If you splash the cash and accumulate everything what are you left with? 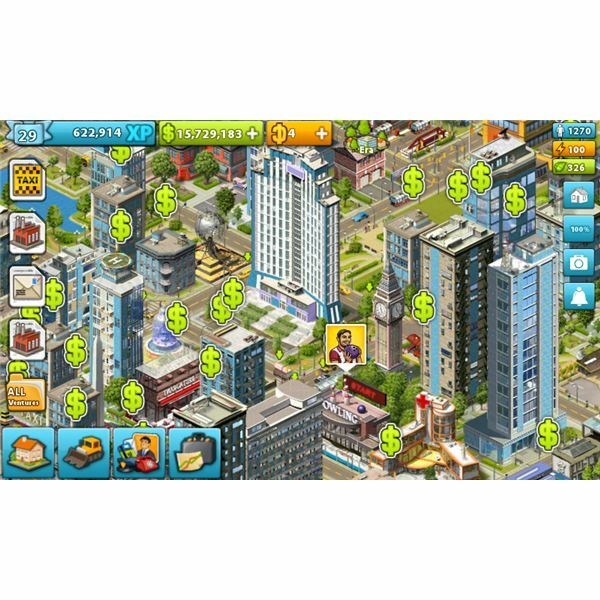 Basically, you are left with a big city where you can tap the buildings to collect your earnings or move things around. It’s not really a glorious ending to aspire to. You could also easily end up spending more cash on Country Bucks than you would on a brand new PC game and there are loads of great tycoon games out there with more depth and rewarding gameplay than this. Should You Try My Country? I’m in two minds about this. If you want something diverting to dip in and out of then why not give it a go, it is free after all. Just be aware that the addictive hook is strong and that spending real cash to accumulate more buildings isn’t a great deal — in short it’s not worth spending much money on. If it was a $2.99 game then I’d recommend it at that price. There is a lot of content and it looks good. If you’re going to spend $20 of real cash on Country Bucks I think you’ll end up feeling disappointed. There’s no doubt the model is working for the developers though, by giving it away free they have a hugely popular title on their hands and the presumably small percentage of people spending real cash is still going to make them a lot more money than if they had released it as a premium game. I think we can expect to see more games like this coming out for smartphones but I’m not convinced that’s a good thing. What’s your take on freemium games? Have you tried My Country? Post a comment and let us know. Screenshots taken by author on HTC Desire. Can We Expect Awesome Mobile Games if We Aren’t Willing to Pay for Them? Is the Future of Mobile Gaming Augmented Reality and NFC?